Written by admin. Posted on September 3, 2012. Filed under Indian Ocean Gyre, Publications, Research. Tagged Indian Ocean Gyre, Research. No comments. 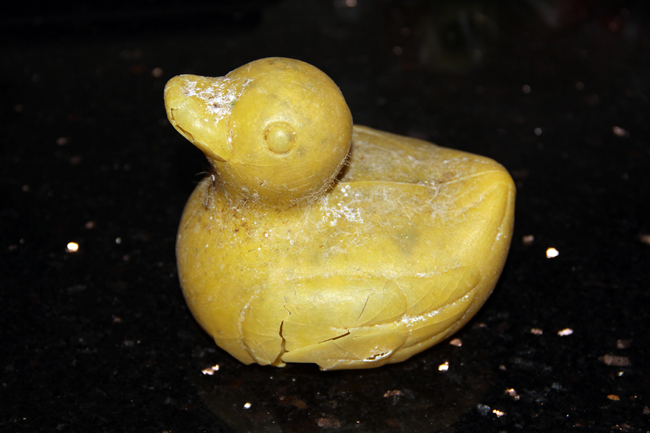 Today I found a yellow plastic duck, the one we probably all know from old bathtub times. It made me think of the most amazing ocean trash story I know: On the 10th of January 1992, during a storm in the North Pacific Ocean close to the International Date Line, twelve 40-foot (13.3 m) containers were washed overboard from a container ship coming from Hong Kong. One of these containers held 28,800 Floatees, a child’s bath toy which came in a number of forms: red beavers, green frogs, blue turtles and the famous yellow ducks. At some point, the container opened (possibly due to collision with other containers or the ship itself) and the Floatees were released. Although each toy was mounted in a plastic housing attached to a backing card, subsequent tests showed that the cardboard quickly degraded in sea water allowing the Floatees to escape. Unlike many bath toys, Friendly Floatees have no holes in them so they do not take on water. Seattle oceanographers Curtis Ebbesmeyer and James Ingraham, who were working on an ocean surface current model, began to track their progress. The mass release of 28,800 objects into the ocean at one time offered significant advantages over the standard method of releasing 500–1000 drift bottles. The recovery rate of objects from the Pacific Ocean is typically around 2%, so rather than the 10 to 20 recoveries typically seen with a drift bottle release, the two scientists expected numbers closer to 600. They were already tracking various other spills of flotsam, including 61,000 Nike running shoes that had been lost overboard in 1990. Ten months after the incident, the first Floatees began to wash up along the Alaskan coast. The first discovery consisted of ten toys found by a beachcomber near Sitka, Alaska on 16 November 1992, about 2,000 miles (3,200 km) from their starting point. Ebbesmeyer and Ingraham contacted beachcombers, coastal workers, and local residents to locate hundreds of the beached Floatees over a 530 mile (850 km) shoreline. Another beachcomber discovered twenty of the toys on 28 November 1992, and in total 400 were found along the eastern coast of the Gulf of Alaska in the period up to August 1993. This represented a 1.4% recovery rate. The landfalls were logged in Ingraham’s computer model OSCUR (Ocean Surface Currents Simulation), which uses measurements of air pressure from 1967 onwards to calculate the direction of and speed of wind across the oceans, and the consequent surface currents. Ingraham’s model was built to help fisheries but it is also used to predict flotsam movements or the likely locations of those lost at sea. 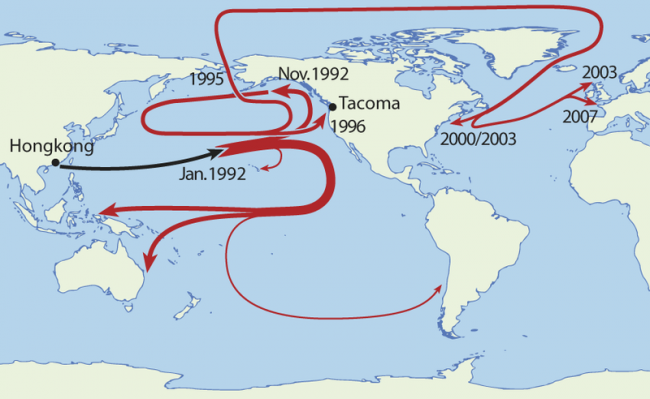 Using the models they had developed, the oceanographers correctly predicted further landfalls of the toys in Washington state in 1996 and theorized that many of the remaining Floatees would have travelled to Alaska, westward to Japan, back to Alaska, and then drifted northwards through the Bering Strait and become trapped in the Arctic pack ice. Moving slowly with the ice across the Pole, they predicted it would take five or six years for the toys to reach the North Atlantic where the ice would thaw and release them. Between July and December 2003, The First Years Inc. offered a $100 US savings bond reward to anybody who recovered a Floatee in New England, Canada or Iceland. More of the toys were recovered in 2004 than in any of the preceding three years. However, still more of these toys were predicted to have headed eastward past Greenland and make landfall on the southwestern shores of the United Kingdom in 2007. In July 2007, a retired teacher found a plastic duck on the Devon coast, and British newspapers mistakenly announced that the Floatees had begun to arrive. 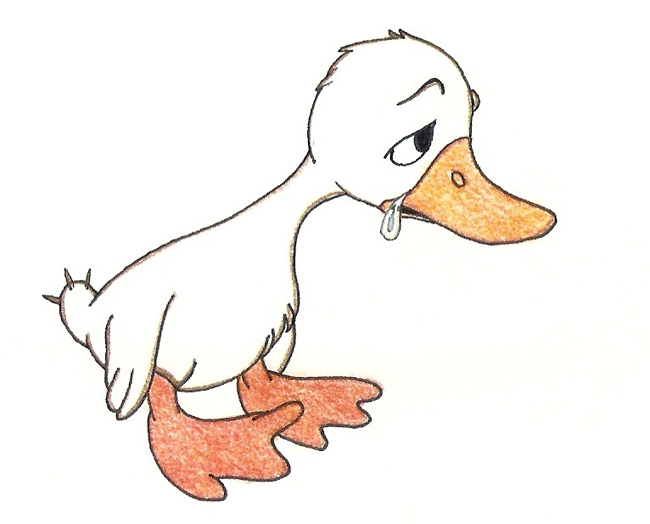 But the day after breaking the story, the Western Morning News, the local Devon newspaper, reported that Dr. Simon Boxall of the National Oceanography Centre in Southampton had examined the specimen and determined that the duck was not in fact a Floatee. Bleached by sun and seawater, the yellow ducks had faded to white. And so ends the story of the ugly duckling who helped scientists determine the ocean currents and locate the five mayor gyres in the world where plastic is accumulating. 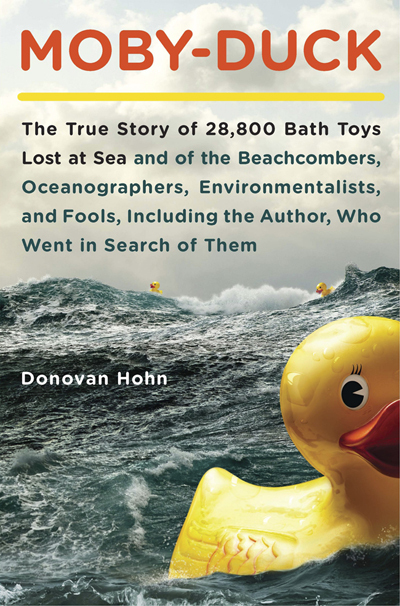 and one by writer and schoolteacher Donovan Hohn who became so intrigued by the story that he decided to follow the journey of the ducks 14 years after they came afloat, all the way back to the Chinese factory where they were born.